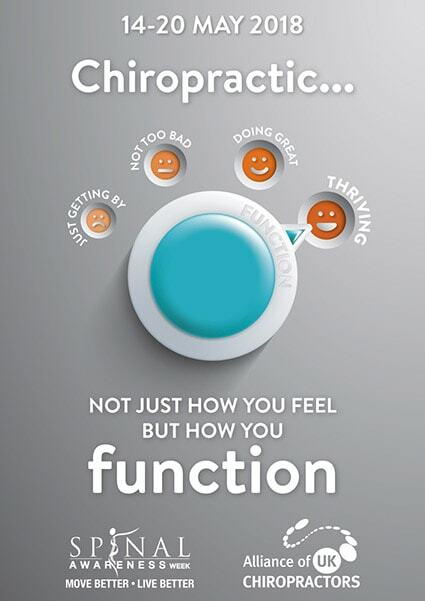 This year the United Chiropractic Association focus during Spinal Awareness Week was ‘Not just how you feel, but how you function’. The clear message is that emotional, chemical and physical factors can cause pressure on our bodies. This is where Chiropractic comes in! We’ll check that your nervous system is functioning as it should, by carrying out a simple, non invasive, physical assessment. We’ll talk to you about your medical history and any current concerns or conditions you have. Together, we can put in place a plan for how to optimise and maintain your overall wellbeing. It’s not quite enough to just feel well, but to actually be well makes such a difference to our daily lives. So how does this relate to Spinal Awareness? Well, you’ll know that your nerves are all connected to your spinal cord, which in turn connects to your brain. This is how your brain is able to send messages all around your body, from your nose to your toes. It matters if your spine is being compromised by habits of posture, or by other physical pressure, as this can have an averse effect on the function of your nervous system. We use gentle manipulation techniques to adjust your spine with the aim of improving the function of your spinal cord. And Chiropractic doesn’t stop there! We want to encourage you in other choices to enhance your wellbeing. To preempt the effects of stress in life, it helps to take good care of ourselves – resting and relaxing regularly, exercising and eating well. Your Chiropractor will talk to you about your habits and your health, and offer advice about exercise appropriate for you. Making regular visits to your chiropractor as part of your healthy lifestyle can enhance your overall well being and help you function at your best. And it’s not just for grown ups! Our children experience all sorts of pressures on their body growing up: navigating sports and riding bikes, working at a desk for much of the day, using mobile devices, carrying bags and kit to school…and much more! It’s just as important to have their spinal function checked by the chiropractor as it is to have their teeth & gums checked by the dentist. Get in touch to find out more about how we can help, or simply book an appointment online now.